eSMarts (etsy Social Marketing Artisans) Team & Social Marketing Artisans/eSMArts on ArtFire hope you enjoy this peek into their creative world of handmade arts & crafts. Visit our Sponsor Shops and Member Blogs too! With profound apologies to Mr. Shakespeare, the title of my post plays on the famous line, "a rose by any other name". Juliet says to Romeo, because their families hate each other, "What's in a name? that which we call a rose, By any other name would smell as sweet". Oh, how I wish that were true for the incredible Russian Chrome Diopside. My pictures can't begin to do justice to this incredible gem. 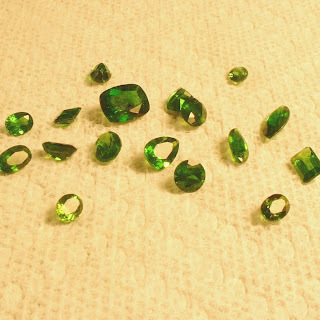 Gem quality chrome diopside could make emeralds weep and green tourmaline envious. 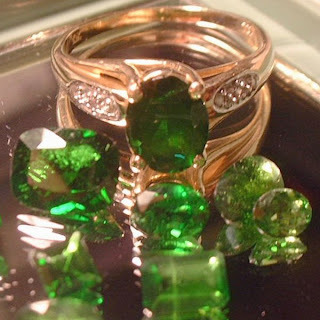 It's deep rich kelly green in color with luster and brilliance to rival Tsavorite Garnet. But this poor gem shall probably never achieve the notoriety of any of the other green gems with a name like ....Chrome Diopside...no savy, no panache, no savoir faire. So sad for a gem which should be able to rival the best of them. And the poor little gem, and I do mean little, since it's colored with chromium which inhibits growth, is rarely found in large sizes, suffers from, another problem. Mother Nature decided to hide this beauty in Russia.....Siberia in fact. Mining can only take place 6 months out of the year. The rest of the time it is buried beneath snow and ice in the perma frost. So, sadly, there is only a small amount of rough mined each year. Doomed to a life of obscurity, buried in the ice, this gemstone is not well known and that has kept the price down. Of course that makes me happy since I intend to buy a lot of Russian Chrome Diopside. Watch for faceted Chrome Diopside pendants coming soon to my store, A Beaded Affair , in sterling silver or custom order one in gold. This stone is worthy of it. Lois, what a fabulous feature article! Will you write more like this for us? Lois, where have you been hiding all of this wonderful talent? I mean, I knew about the design, and the color coordination, and now the writing and investigative abilities. You are as much of a gem as anything we can string, wire, or bezel. You go Girl! I'm sorry! I missed this post somehow previously. I love chrome diopside. The colour is glorious! wholesale jewelry cultured akoya pearls,freshwater pearls and pearl jewelry–pearl necklace,pearl pendant pearl earring ,pearl bracelet, pearl ring, pearl strands from China. To view ALL our items currently available for sale on etsy Click HERE! Links to our ArtFire Gallery TBA. Shopping at Tiffany & Co. - care to join me?